Anyone who owns a pistol caliber long gun like the Ruger PC Carbine or a standard handgun like the CZ P-10 C chambered in 9mm Luger will love this ammunition for plinking, training, and competitive use. 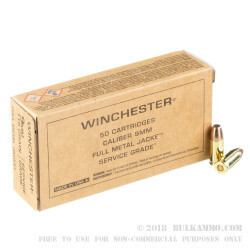 Winchester's Service Grade ammunition comes at an affordable price point and is known to feature "hot" loads which offer greater pressure and muzzle velocity; this can be useful for cycling the heavy bolt of a blowback AR-9 or for knocking down steel poppers and plates without any hesitation. 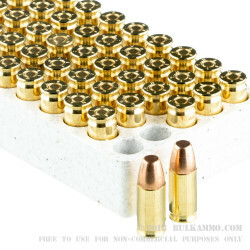 Each cartridge features a non-corrosive Boxer primer that is installed at the bottom of a reloadable brass casing. The case hosts a measure of Winchester's own propellant grains that will burn efficiently for consistent performance with every shot. 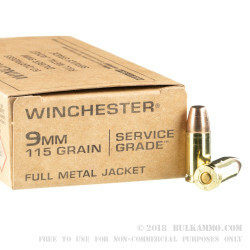 This lightweight 9x19mm load utilizes a full metal jacket (FMJ) bullet weighing in at 115 grains, the most popular mass for the caliber due to its light recoil and simply tracked trajectory out to common shooting distances. FMJ projectiles feature lead bodies encapsulated by copper jackets that cut down on lead fouling for more accurate shots between cleanings. These particular FMJs have curved ogives for reliable feeding, especially in older pistols, complimented by a flat tip which is well-suited towards soft targets like paper and cardboard due to a penchant for cleanly cutting circular holes that are more easily measured and scored. Winchester is one of America's premier companies and has over 150 years of experience manufacturing top quality ammunition for several purposes.